Happy Solar Eclipse in Aquarius! The Seed Moon is beginning earlier this year giving it a different kind of energy. The new season will not be here for another month or so, but we are already feeling the currents of inspiration whisper in our ears with gentle breezes, or hit us in the face like gusts of wind. Are you sensing a theme? Air is the theme this cycle, and like the New Moon, though you cannot see the wind... you can definitely feel its presence all around you. To integrate these changes and big energies in this cycle remember to work with your breath. Breathe in this energy, integrate them into your cells, and breathe out your light and love. We are constantly recycling the same particles we breathe in and exchange with others, so let them be uplifting and filled with love! Get cozy and grab a cup a tea and reading the energy of the 2018 Seed Moon cycle below! Solar Eclipses are potent New Moons in almost exact alignment with the Sun... it truly creates a portal or wormhole into other realms. With the New Moon in Aquarius expect the unexpected, and have an open mind to think outside of the box and outside of societal norms. Aquarius is a transpersonal sign ruled by Uranus, so Aquarius gets ignited and inspired by projects that impact the collective, not just the individual. This amped up New Moon is thee New Moon to set intentions for big dreams and projects that reach a lot of people, impact the world, and can truly shift consciousness. Just imagine if everybody on the planet on the same exact day envisioned world peace... that would be a huge energy shift and a restructuring of the grid of the collective consciousness as we know it! The card pulled for today is Waxing Gibbous: Connect... What dreams and long term goals do you have for your community? What do you wish to bring to the community? Do not doubt your vision! This is truly your time to start bring your unique magick and offerings to the table. This will inspire others around you to do the same! With the First Quarter in Gemini, communication is prominent... finding where Gemini or Mercury (ruler of Gemini) is in your birth chart will help you find your unique communication style. This is also the time to start taking action on the big dreams you set on the Solar Eclipse a week ago... vocalize and share them with your tribe. They need to hear your plans and you need to remain accountable... Air signs (Gemini and Aquarius) have amazing visions and insight, but can get distracted easily. Hold yourself accountable and don't waver from your vision. Speaking aloud affirmations would be wonderful at this time. The card pulled is Libra: the Lover... finding harmony and balance between listening and speaking is key right now. If your Mercury is in Libra, or Gemini in the 7th house (house of relationships, ruled by Libra), you can be very diplomatic, kind and fair in your discussions, but may avoid confrontation at all costs to keep the peace. This may be a time for you to stand up and hold your ground! Depending on your time zone, some people will experience this Full Moon on March 1st or the 2nd, so double check using a moon app with your exact location! The Virgo Full Moon is grounding and inspiring... though Virgo is an earth sign She is also ruled by airy Mercury... the air theme is big in this moon cycle... offering fresh ideas and currents of inspiration if you are open to them! Virgo also knows how to organize, so use this meticulous energy to your advantage... write your to-do lists and create a vision board to solidify your goals into reality. The card pulled is the Super Moon... the Super Moon energy is still potent from the last moon cycle and with the Aquarius energy from the Solar Eclipse... continue to expect the unexpected! If you have been working on your dreams and creating solid plans... surprising news, opportunities, or changes around you are bound to happen! Say YES, keep your Heart open and your mind focused! The Last Quarter falls in the fiery sign of Sagittarius... however Sagittarius carries the spiritual torch of the fire signs (Aries, Leo, and Sagittarius). The quarter moons are always good check-in days; check-in with your energy, goals, emotions, body... Do you feel connected to your purpose? What have you learned about yourself and your purpose this moon cycle? The card pulled for this week is the Waning Crescent: Rejuvenate. Sagittarius is half house/half human.... the balance between body and mind. Tend to your body. Our bodies have an intelligence that is pure and connected directly to Gaia and during the Last Quarter moon you can really connect to this energy. What do you need to rejuvenate your body and your mind? Follow what feels good to your body, what soothes your mind and release the rest. Calendars are no longer pre-orders and we have shipped all of the calendar orders thus far! Processing the orders is now only 3-5 business days, so if you feel called to having one of our calendars adorn your walls, go check them out! We hope you enjoyed this reading and make sure you dream big and go for it! Put our some water, crystals, and your decks under the potent Solar Eclipse! Happy New Moon and Total Solar Eclipse! 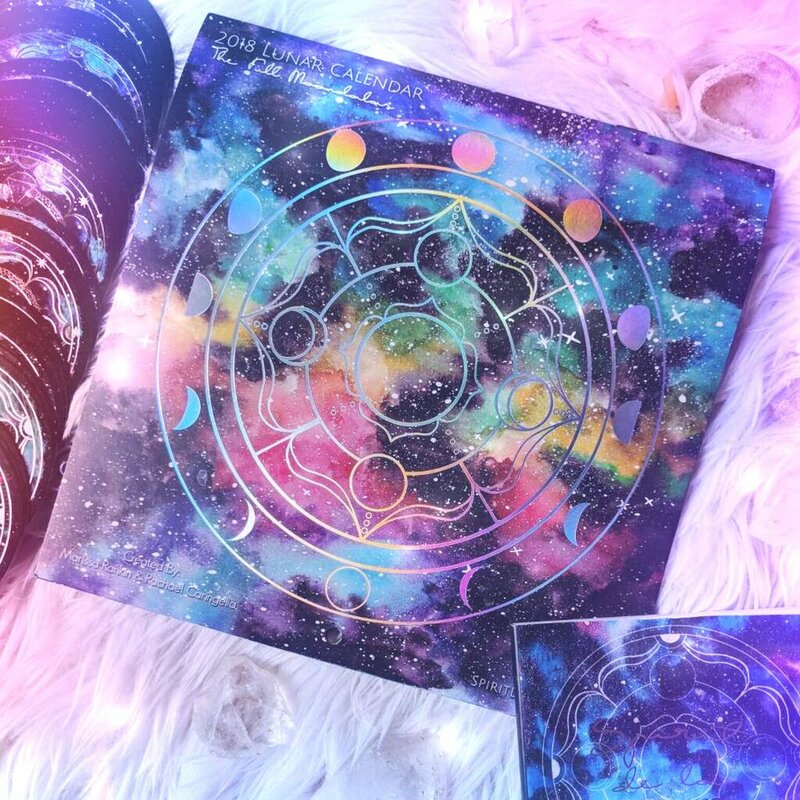 You can now order the Spirit de la Lune deck! This New Moon calls in the Seed Moon cycle.... new growth, expansion, and a reawakening takes place on the land and in our bodies. We are open to a new season, a new chapter, a new path. In the Northern hemisphere, the Seed cycle is also when the Sun moves into Aries, the initiator of Spring and the fire and the warmth that moves through Gaia during this time. This is the Moon energy reading for this new cycle. Starting to the right, in the East, and moving clockwise along the elemental wheel: New Moon Solar Eclipse in Pisces; First Quarter in Gemini; Full Moon Prenumbral Lunar Eclipse in Virgo; Last Quarter in Capricorn. There is potent energies of Earth and Water in this cycle as they align with the eclipses. Eclipses happen during the equinox seasons, while everything is aligning and coming into balance. If something is not aligning with your big dreams and visions of new growth and expansion, allow them to fall away. The Earth element asks us to come into alignment with what feels stable to us and the structures within our lives. There is new territory for you to explore! What outdated beliefs of stability do you need to let go of? Water is the realm of the emotions and the connections we weave through our lives. Do you relationship support you? Do you feel emotionally supported at this time? This New Moon is a big energy portal. Not only is it a Total Solar Eclipse, but also a Super Moon! A threshold is waiting to be crossed deep in your subconscious. Pisces is the fish that can swim in the deep ocean of your subconscious to unlock your dreams and desires. Dive into this vortex. Carve out time in your day to daydream, take a sacred pause, and allow Pisces to move through you. Pisces is empathetic to a fault so your emotional body will be expanded exponentially. If emotions rise like high tides, breathe into them and ask yourself if they are truly yours or from others around you. If they are not yours, send them back to the earth. Imagine an amazing waterfall of turquoise light cascading down on you and cleansing the energies that are attached to you. Let them soak into the earth. With the Super Moon the waters in your body will be stirring - so drink plenty of water, take mineral baths, and stay hydrated. The card pulled for this phase is the Waning Crescent: Support. The Super moon charges this already amplified New Moon, so your intentions will have deeper impact on your life than you can fully imagine right now. Pisces wants you to dream BIG! Do not allow helplessness to overcome you and keep you small minded. Stay grounded in your truth and in your body to fully support your visions. Seek support from your tribe of kindred spirits - together you can fully support each other and allow abundance and love to flow through your whole community. Neptune rules Pisces and the realm of the Mystic Heart and universal love. The intentions you create now can affect your community and ripple through the world. Allow love to guide you, stay grounded to Gaia, and swan dive into deeper dimensions of your heart! Crystal allies: Lapis Lazuli to connect deeply to your intuition and your Higher Self; Lemurian Crystal Seed to manifest your vast visions and support your light body; Moonstone to embrace these new beginnings and to flow with your emotions. The twins come out to dance under the Waxing Moon. The First Quarter Moon is the initiator of fire in the moon cycle... Ignite your dreams and move forward with passion. Gemini can help you discern the dreams and desires of your ego and your higher self. The ego will always be here to help us navigate the daily in's and out's of life, but we can also call upon the ego to help support the dreams of our souls. Ask the twins within you, "What is the motivation behind my desires?" The New Moon has asked you to ficus on the love of the world, your community and how you can spread your dreams far and wild. If your ego is trying to contain this out of self-preservation let your mind open to bigger possibilities. Dream BIG and respond to the calling. Lunar Eclipses always happen during the Full Moon phase. A Prenumbral Lunar Eclipse is partial, but nonetheless the shadow of Gaia caresses the terrain of the Moon. Divine Feminine energy is potent and embodied during these times. Embody your magick. Embody your sacred creative power. The Full Moon is in the earth priestess sign of Virgo. She is a practical mystic and knows how to create a sound structure for which spirit can thrive. Your body is a vessel for the Divine Feminine energy to flow through you. Nourish your body with Gaia's abundance, befriend plant allies and learn from their wisdom. Eat the rainbow. Holistic healing filters through all levels. The card drawn for this phase is Waning Gibbous: Devotion. Stay devoted to your spirit. Allow Virgo to guide you to create nourishing daily rituals for your body, mind, and spirit. Virgo is ruled by Mercury and logically oriented, so put your mind to good use! During the Full Moon write out what your spirit needs and what stable structures can help you feed your soul. Crystal allies: Fluorite to unite your Heart and Mind into one; Goddess Stone to honor the Divine Feminine moving through you; Lapis Lazuli to connect you the the Queen within you as you define your realm; Malachite to clear your heart and body of negative attachments. This cycle has taken us on a journey, but it is not over yet. As the Moon wanes the Last Quarter Moon falls into the earthy Capricorn sign. Saturn rules this sign with order, traditions, and stability. A big theme in this cycle, yeah? What outdated fears and perceptions of traditions and order need to be released? Are you accountable for your words and actions - do you walk your talk? Saturn can straighten you out! Expansion is yours if you can remain grounded but curious, and not rigid in your thought patterns. Be aware of tunnel-vision and you if you need to rest, listen to your body and relax. Open spaces are waiting for you to step into new growth. Bloodstone: Clears and detoxes the body of impurities. Citrine: Opens you to abundance and positivity. Clear Quartz: Magnifies intentions and manifestation. Green Aventurine: Sparks adventure and new possibilities. Sunstone: Enhances motivation and energy. If you do not have the deck yet, be sure to check it out!